I ate my last piece of leftover Thanksgiving pie Sunday, for breakfast. Don’t judge. It was pumpkin, which is technically a fruit. If you’re like me though, after a bit of indulging for a few days, I’m ready to get back to my normal diet. Until Christmas, then I’ll do it all over again. This is why in-between, you need to do your best to stay on track. The easiest way to accomplish this, is to meal prep. Meal prepping doesn’t have to be labor intensive, nor does it require a lot of time in the kitchen. Sunday, I whipped up four meals in a matter of thirty-minutes. Let me tell you how. First off, consider how many meals you plan to eat at home, or pack for work. Planning for a full week may seem daunting, so try a few days instead. For instance, I’m traveling later in the week and could only plan meals for Monday and Tuesday. Once I get to my destination, I’ll work on meal planning for the end of the week based on what I have on hand. That leads me to the next step. Take inventory. Look what might be stuffed in the back of the freezer. If it’s still eatable, pull it out. The end of the year is a good time to check expiration dates and use or loose. Check the fridge too for any produce that needs to be used. Hopefully, you have some staples in the pantry. You do, don’t you? If needed, make a list of items to fill in the gaps and run to the store. The idea is to keep it simple. I wanted to use up some leftover items from Thanksgiving, so I considered what I could make. I had a package of individual sized pizza crust in the freezer, which quickly thawed on the kitchen counter. I grabbed a few items from the fridge and pantry. For some reason, I had a lone tomato on the counter. This is what I put together Sunday. 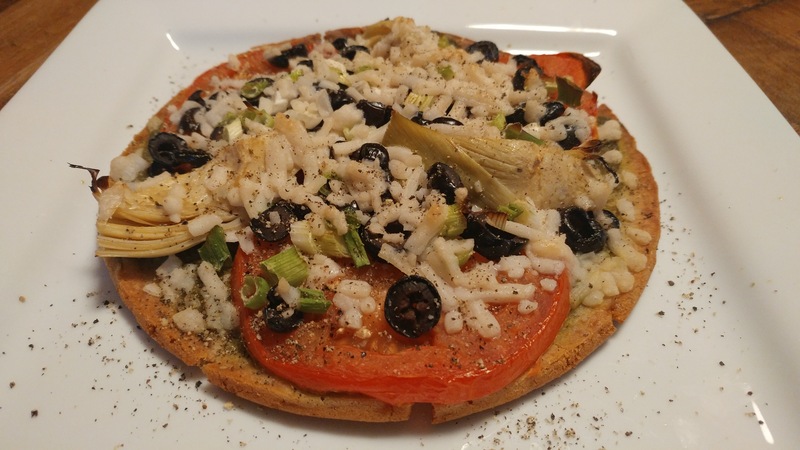 Pesto sauce, tomato slices, artichokes, black olives, green onions and chives, mozzarella, and black pepper. Less than ten minutes to assemble the two crust, and ten minutes to cook. I had diner that night and lunch for the next day. I highly recommend keeping pizza crust in the freezer. 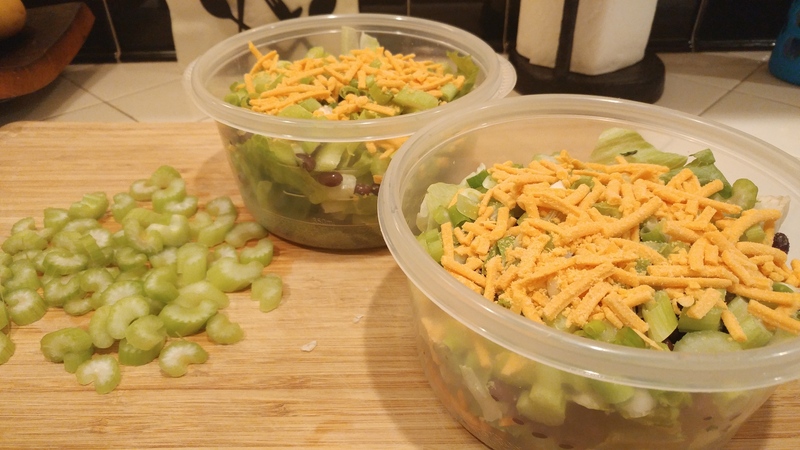 I also made two simple salads. One I ate with the pizza, the other I saved for the next day. Arugula and celery in lemon vinegar with a sprinkle of vegan parm. Simple but good. 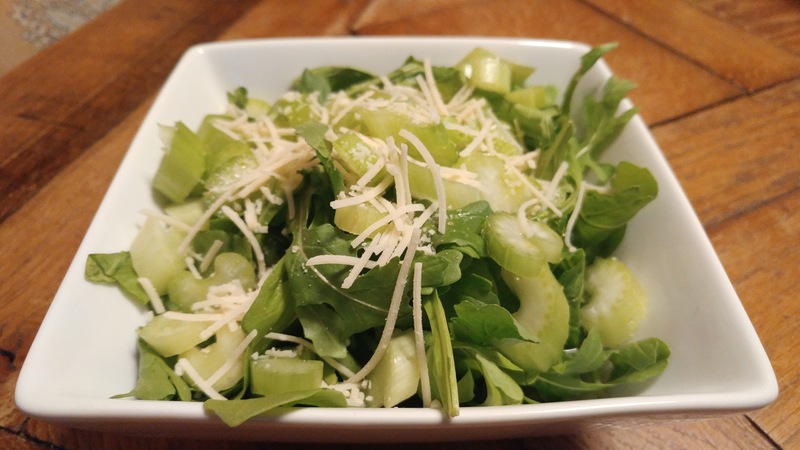 I always keep greens in the fridge for a quick easy salad to pair with soup, sandwiches, or to make a big ole’ salad for a meal as seen below. Also evidenced on my Instagram account. I layered romaine, drained and rinsed black beans, celery, green onions, leftover vegan cheddar cheese from Thanksgiving vegan sausage balls (recipe Thursday). I will add a avocado lime dressing when ready to eat. Five minutes to assemble two salads, two meals. My last tip is to make a batch of beans and grains, which can be done quickly in a pressure cooker. At the same time cook up a few sweet potatoes. Store them in the fridge to use for building healthy bowls during the week. All that’s needed is some cooked or fresh greens (grab from your stores salad bar) and a tahini sauce. It doesn’t get any easier. My last tip is to keep healthy snacks around like carrots and celery sticks with hummus, individual portions of nuts, fresh fruit, raw crackers with almond butter, and lots of avocados for a quick batch of guacamole (see my recipe here http://katmendenhall.com/recipe/holy-moly-goals-and-guacamole/). Holidays can get our eating off track for a day, or two, or three. Our bodies can react in defense. Take some time to plan and prep healthy meals that will help reset things. Focus on the foods that are a part of you normal diet, which hopefully is plant-based.